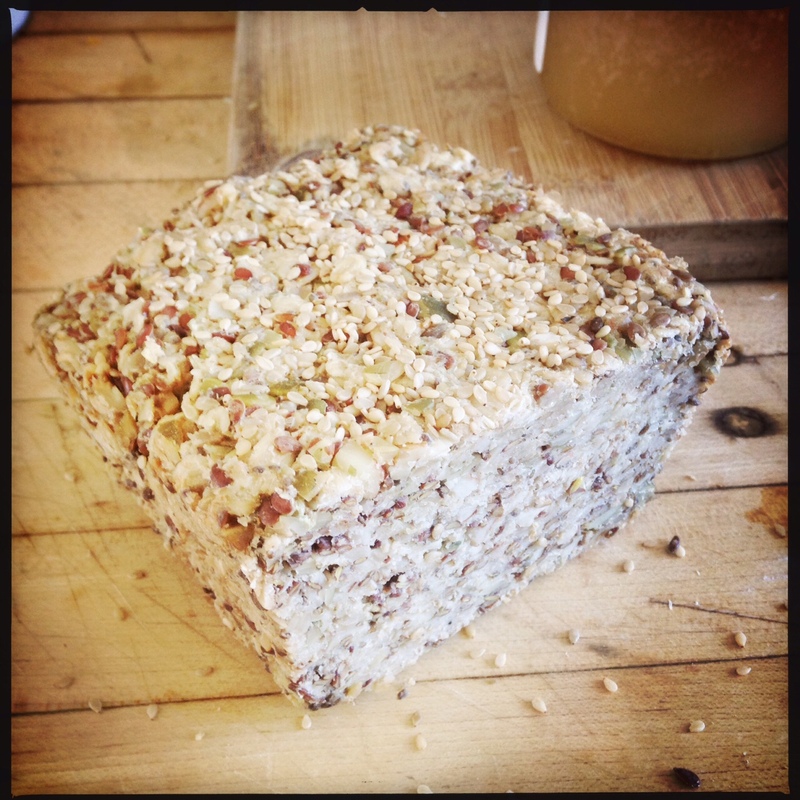 Uncategorized | Levine's General Store: The Gluten-Free EatUP! 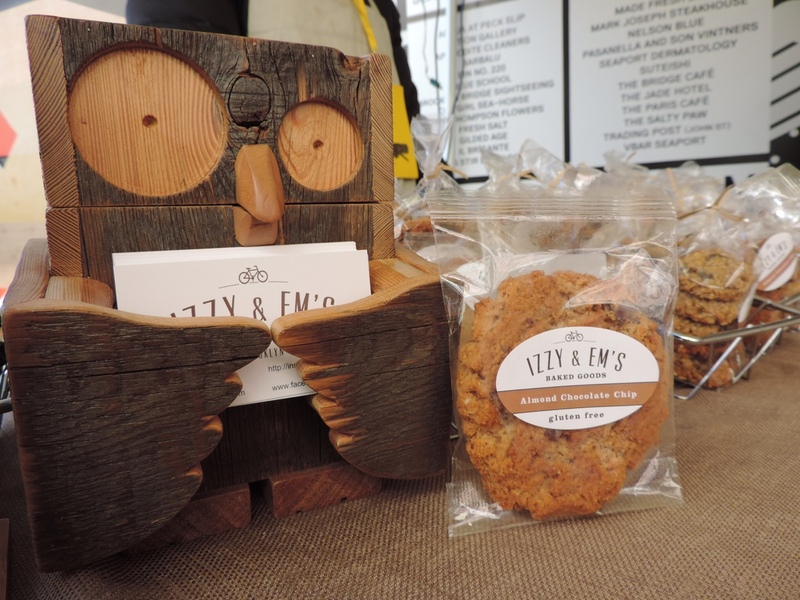 Along with hikes, and ponds, and alpaca farms and chickens, and chasing thunderclouds, a big part of summer probably most anywhere, and especially in the Columbia County, NY and surroundings – is experiencing the farmer’s markets, in their abundant glory. An excellent gluten-free (and otherwise) cook and master griller, my brother wanted to make sure we made it first to Hudson Farmers Market ( in Hudson!) for vegetables, maple almond butter from Tierra Farm, pickles, and….mochi sticky buns from Happy Belly Bakery of Hudson, 100% gluten-free. Already sold out of the sticky-buns by 10am, we persevered and bought a few loaves of their nut/grain bread, and a chocolatey chocolate brownie treat for my niece. The next day, we hit the Valatie Farmers Market. Here, we spent quite a bit of time, tasting, buying and talking again with Happy Belly owner and baker Monica Jerminario, and her husband, who helps man their stand, in between also working at Tierra Farms. If memory serves ( which honestly it does not always) Monica suffered for many years and through college with various debilitating ailments, until finally (after many medical professionals insisting it was in her head or some such) the root of all was found to be the effects of malabsorption from gluten. ie. she had Celiac Disease. Monica stopped eating gluten, and never turned back. She worked in restaurant kitchens, with gluten, and eventually as a matter of course started baking and cooking inventive and experimental gluten-free creations. 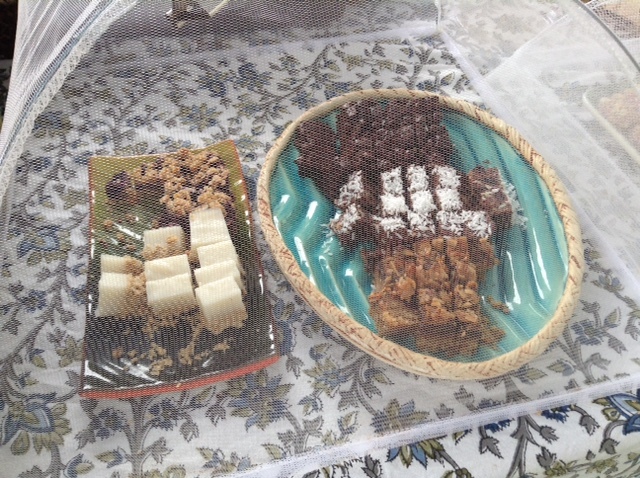 Monica likes to infuse flavors from various cultures, and unlikely combinations, among her sweets and savories. 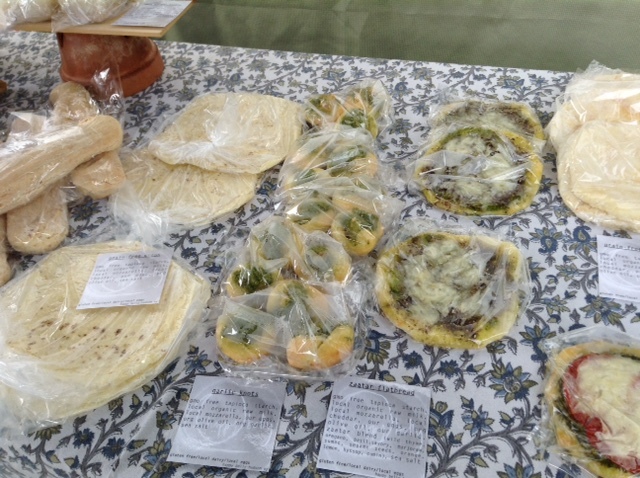 Likewise, they have those hard to find items like “wrap” bread for sandwiches, baquettes, and farm fresh fruit baked goods. Many items are vegan as well, and organic ingredients are used whenever possible. Ingredients are always listed with items. 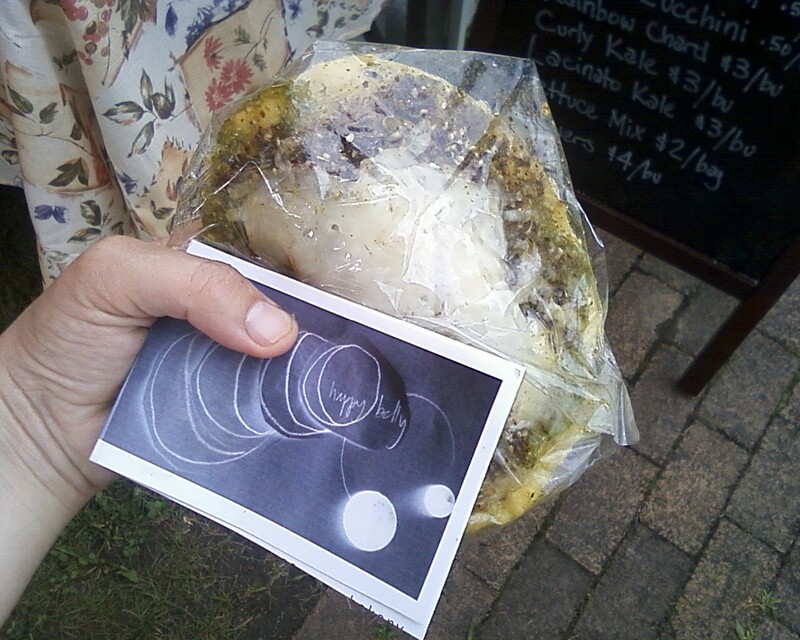 I am a savory food lover, so I just had to try the Zaatar Flat Bread. Mmmm, mmmmm. Holy smokes. 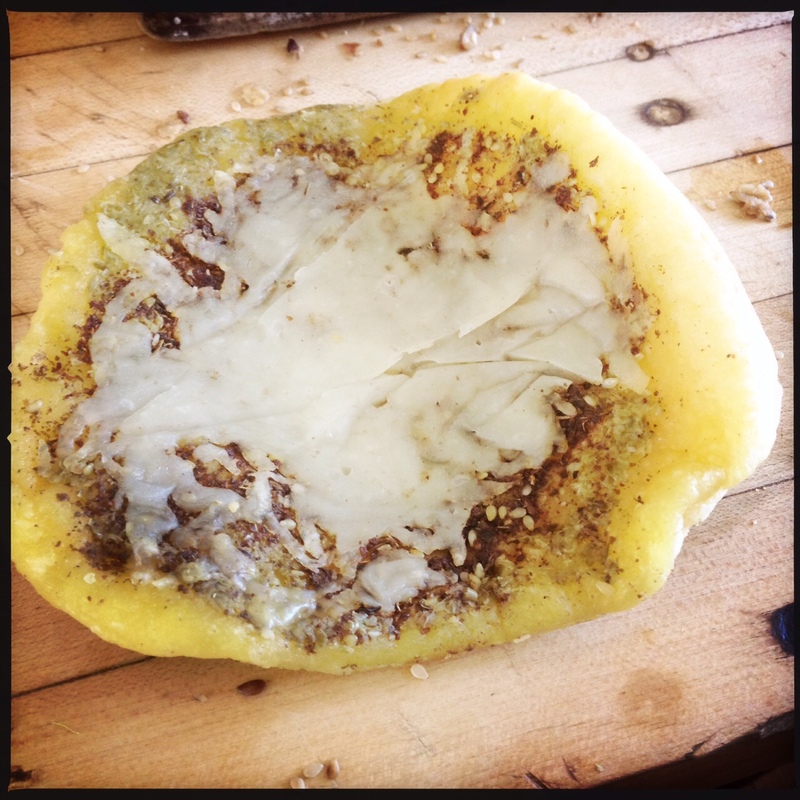 Drizzled with an almost tangy olive oil, cheese, a gooey kind of succulent dough, I was a happy market goer. Once my niece had a taste, it was no longer mine and I had to purchase a second. The heat of the day, actually enhanced the yumminess in my opinion. After gobbling up the Zaatar bread it became obvious that I would have to buy the garlic knots ( I mean really, c’mon). 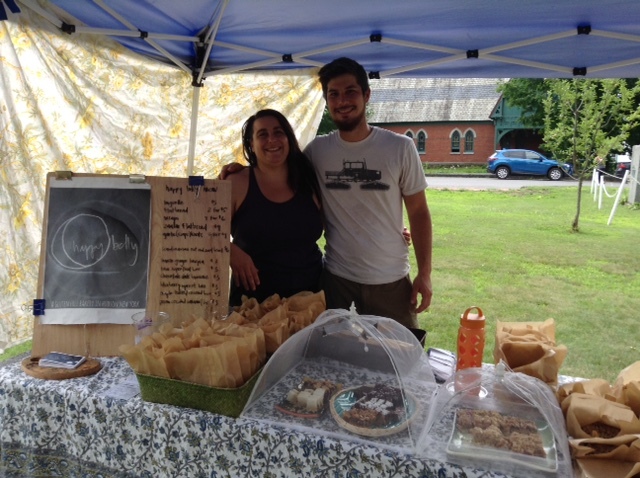 Happy Belly can be found most weekend’s at the Hudson and Valatie Farmers Markets. I urge you to take a road trip, follow them on Facebook, and keep them on your radar. Say hi from Deb! The girl loves her farm fresh corn. We ain’t afraid of no snow. Big thanks to the innovators and the guests who braved the snow, from New Jersey, Staten Island, Upper West Side, and all parts of Brooklyn, Manhattan and Queens. An impressive group indeed! 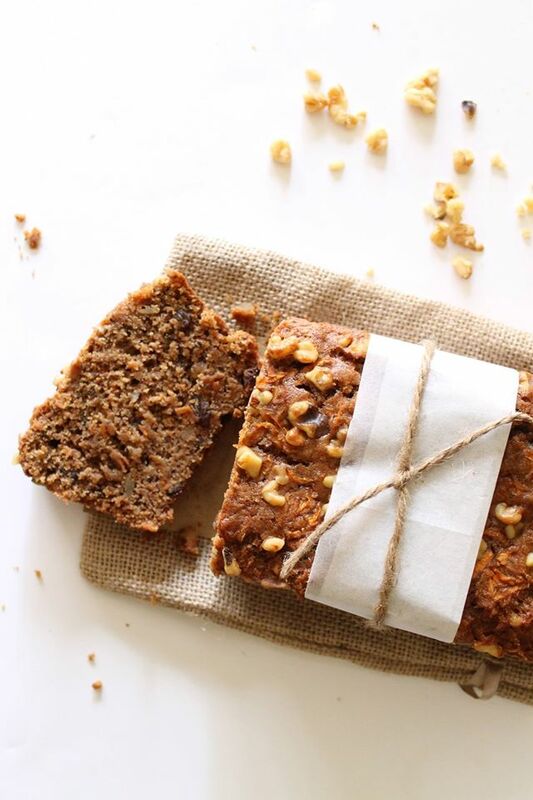 Gluten-Free and full of tasty treats. Here Comes the Sun: Meet Cali Girl Bakes – a new gluten-free baking company based in Harlem NY, by way of sunny California. Co-founder Tatianna Gonzalez is sure to bring (some much needed) sunshine and warming classic baked goods , to the Gluten-Free EatUP! Anniversary market on Sunday March 1st. Just months after receiving a degree in Baking and Pastry Arts – it was confirmed that Tatianna had a gluten sensitivity. She then started on her path to learn and master the science and art of gluten-free baking. Late nights and many experiments later, just less than a year ago, Cali Girl Bakes launched. Naming Rights Founder Tatianna Gonzalez says: Our name Cali Girl Bakes comes from a nickname I was given by my fiance/business partner and friends when I was the “new girl” around. The nickname stuck around and during my long nights of gluten-free recipe testing my fiance would tell me, “Cali Girl, you can do it!”, it was the perfect name for our company and holds a great sense of meaning for us. 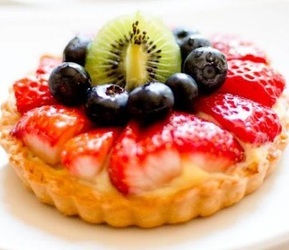 From festive and classic cakes, to chocolate chip and gingerbread cookies, biscotti, and seasonal pies and tarts. 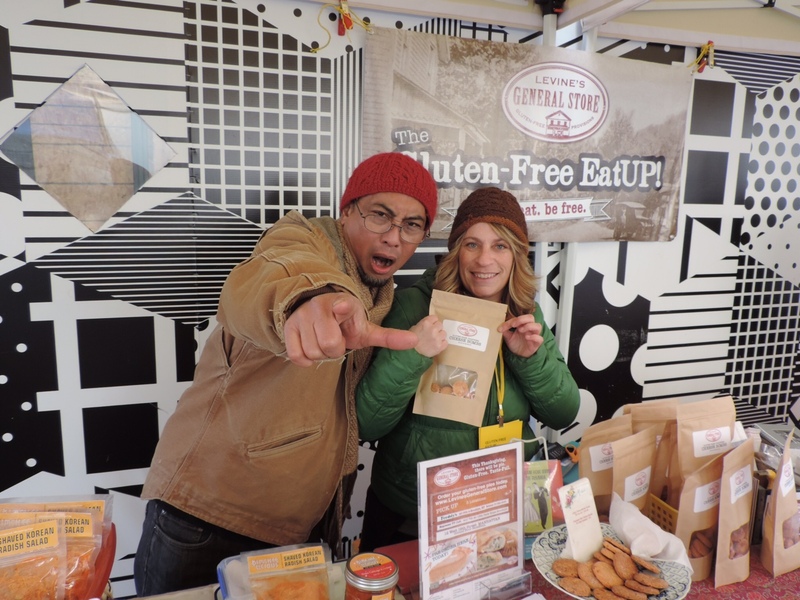 Raffle Love at The Gluten-Free EatUP! 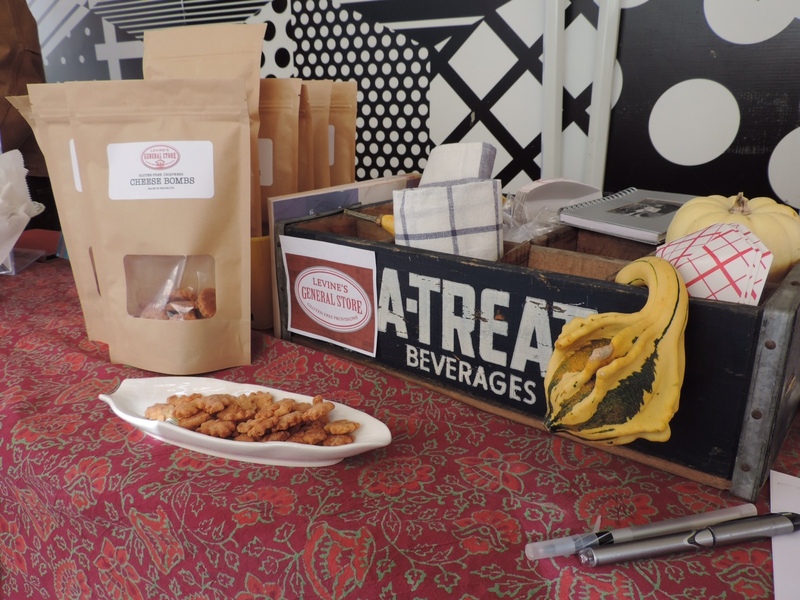 Let’s Celebrate: Levine’s General Store will raffle off gluten-free and related items at The First Anniversary Gluten-Free EatUP! All the monies raised from the purchase of your ticket will benefit the great works at the Celiac Disease Center at Columbia University. (It’s a win win kind of situation!). Who doesn’t love a good raffle? Jon Stewart’s The Daily Show in NYC. (Among a million other great things, Mr. Stewart is a champion advocate of Celiac Disease awareness). Prizes will also feature graciously donated yummy treats and gift certificates from our event merchants, and favorite, far away, yet locally minded partners: Brŭlee Bakery – Pennsylvania based gluten-free artisan bakery, delicate cookies by the enchanting, Chef Lila (2010 James Beard Scholarship winner) and Kim and Jake’s Gluten-Free Bakery a husband and wife team establishment from Boulder, Colorado offering breads and buns! 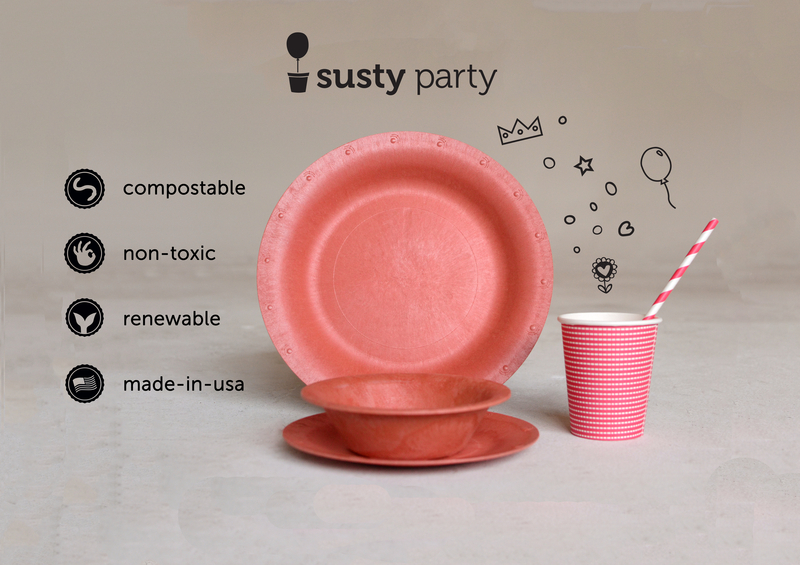 Also, party-ready goodies from Brooklyn based Susty Party – compostable, colorful, responsibly made disposable tableware. And, imported Italian pasta courtesy of TasteUp Foods. Raffle tickets available day of event only….however you do not have to be present to win. Though it would be great if stayed all day. Levine’s General Store First Anniversary Gluten-Free EatUP! A celebration of locally crafted, gluten-free, taste-full foods. Tagged Brulee Bakery, Celiac Disease Center, Freddy's Bar and Backroom, Kim and Jakes Bakery, Levine's General Store, Susty Party, The Daily Show, The Gluten Free EatUP! Meet The Maker: This Pie is Nuts! When life gives you lemons, go nuts, make pie! A welcoming cheer to baker Diana Cornell, creator of This Pie is Nuts! – individual pies, made entirely out of nuts, nothing processed – nutrient packed – with luxurious fillings and a crunchy crust. (9″ pies available for special order). Twenty years ago Diane was given the debilitating diagnosis of Multiple Sclerosis. “I was told there was no cure and that there was nothing, aside from some medicine to keep it at bay, that I could do to stop it. I decided that one way to ensure my health would be to take better take control of my diet. I wanted to continue eating good tasting food, but I wanted to avoid anything that wasn’t good for me.” Thus began her adventure towards starting her own food business. For months I had been hearing quite a positive buzz about Diana’s Paleo, Vegan, Gluten-free pies. Finally when I stumbled upon her booth at Bryant in Park in December (it was very busy, I might add) I learned first hand (first mouth? ) what the fuss was all about. Diana’s energy is infectious, and I have complete admiration for the fact that she started her own dedicated gluten-free kitchen, and a product that resonates with so many, in just under a year. That’s nuts! 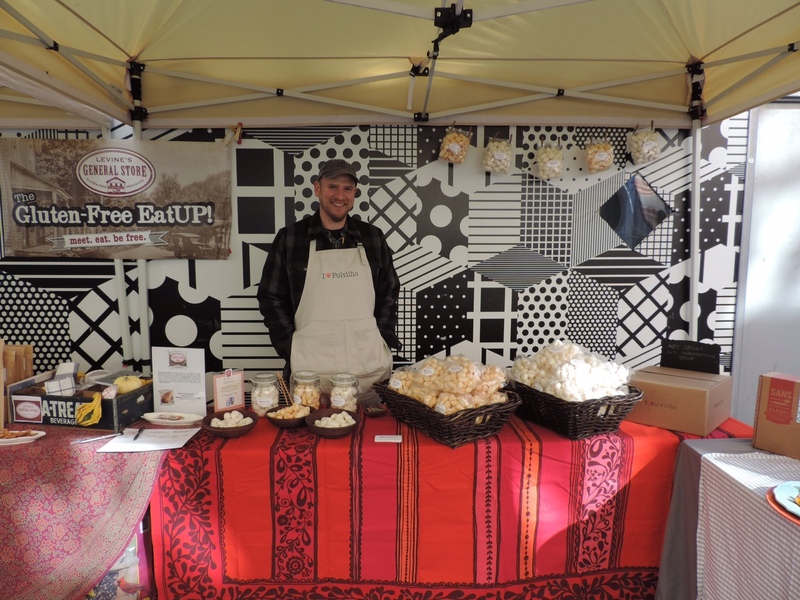 Meet Diana at the First Anniversary Gluten-Free EatUP! on Sunday March 1st – With flavors like chocolate mousse, coconut cream, key lime and sweet potato pie, I wish you the best of luck in choosing! Visit This Pie is Nuts to learn more. Meet the Makers. Mingle. Eat. Be Free. Raffles! Tote Bags! GLUTENBERG BEER and Good Vibes at the bar! The Gluten-Free EatUP! is Turning One! Join us to celebrate an afternoon of locally crafted, gluten-free, taste-full foods that just might knock your woolen socks off. 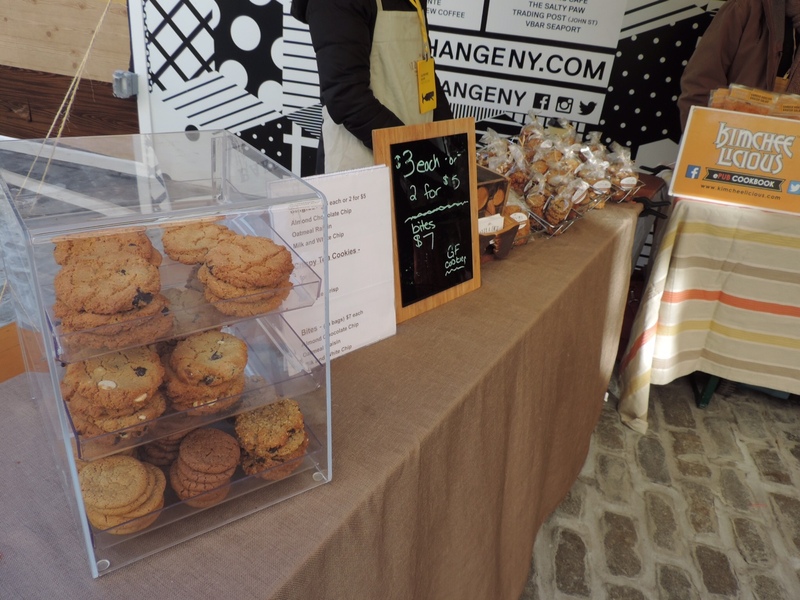 You deserve a break from hibernation, so spring on over because New York City’s first and only, all gluten-free pop up market is back in town. Hosted by Levine’s General Store: Gluten-Free Provisions and housed in the welcoming, local stalwart Freddy’s Bar in South Slope Brooklyn, the First Anniversary market features new and returning merchants, $5 American Pale Ale and tasting from our Sponsor Glutenberg Beer (GF), A chance to win tickets to The Daily Show and other raffle items, benefiting the *Celiac Disease Center at Columbia University, and good vibes all around. The Gluten Free Bakery of Chatham NY, Kickin’Mac-n-Cheesemade with imported Italian pasta from our Pasta Sponsor Taste Up Foods. · Kimcheelicious Tangy small batch vegan kimchi – almost as good as a Korean grandma’s. 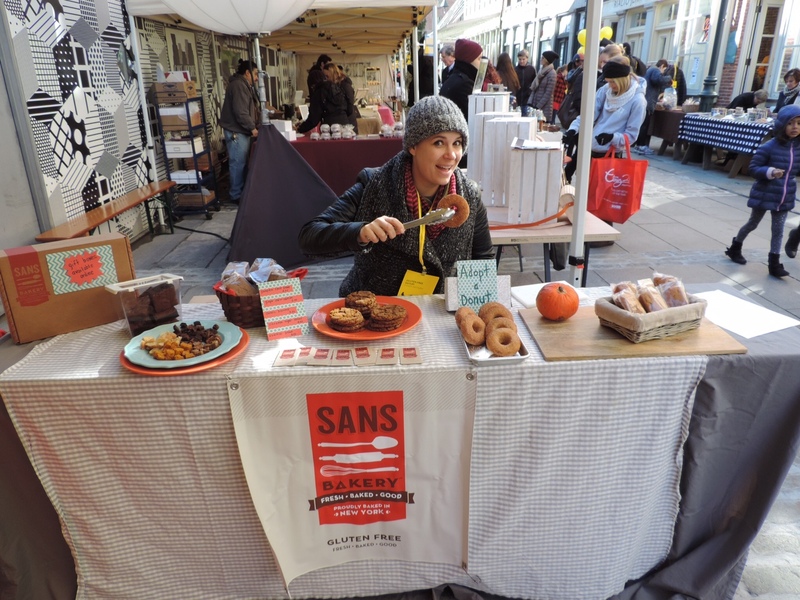 · Sans Bakery Donuts and ginger cookies to weep for and other baked goods from this trailblazing bakery. 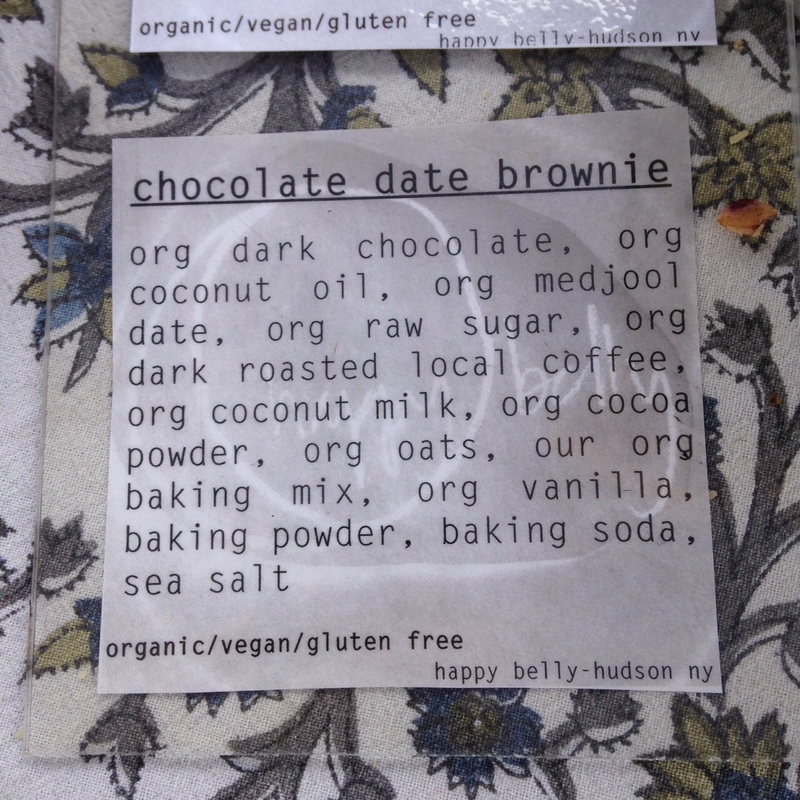 · Gone Pie All matter of vegan baked goods, chocolate treats…and, you guessed it, pie! 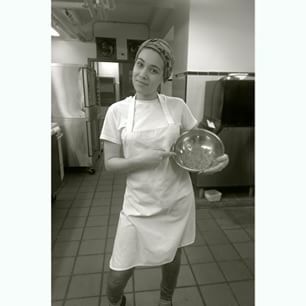 · Krumville Bakeshop Focaccia, amaretti cookies and classic baked goods from this Italian influenced baker. 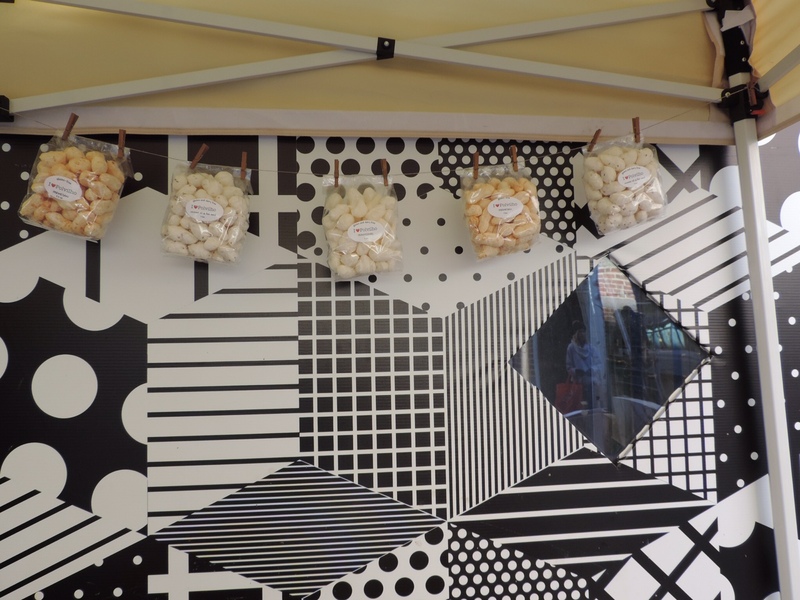 · Polvilho Bakery Bite into a taste of Brazil withYuPuffs, artisanal, baked and naturally gluten-free snacks. Addictive! 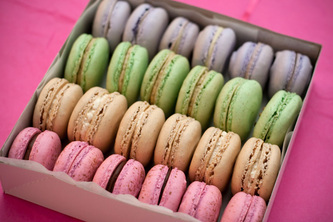 · Smart Snack Bites Decadent confections and truffles with Indian spiced influences. · This Pie is Nuts Individual squares of Certified Paleo and vegan pie with luxurious fillings, key lime to chocolate mousse. 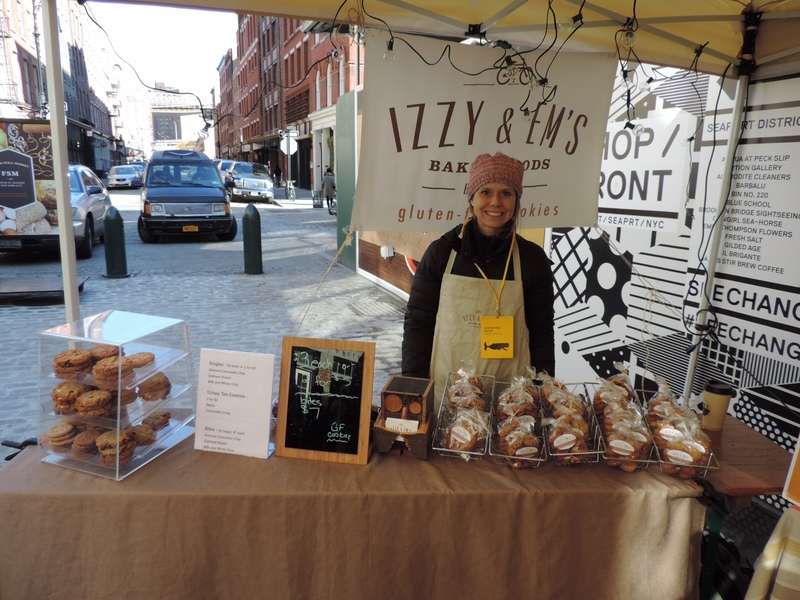 · Cali Girl Bakes New on the scene, this Harlem based baking company crafting classic treats like biscotti, lemon pound cake, cookies and more. · Kulushkat Stepping out from their Brooklyn restaurant to serve up their kosher, and gluten-free Israeli salads and cuisine. Whether motivated by Celiac Disease, intolerance, sensitivity, general health or curiosity, more and more people are seeking gluten-free foods. The choices don’t have to be sad and boring. Come by and meet the makers, sample, eat and shop. 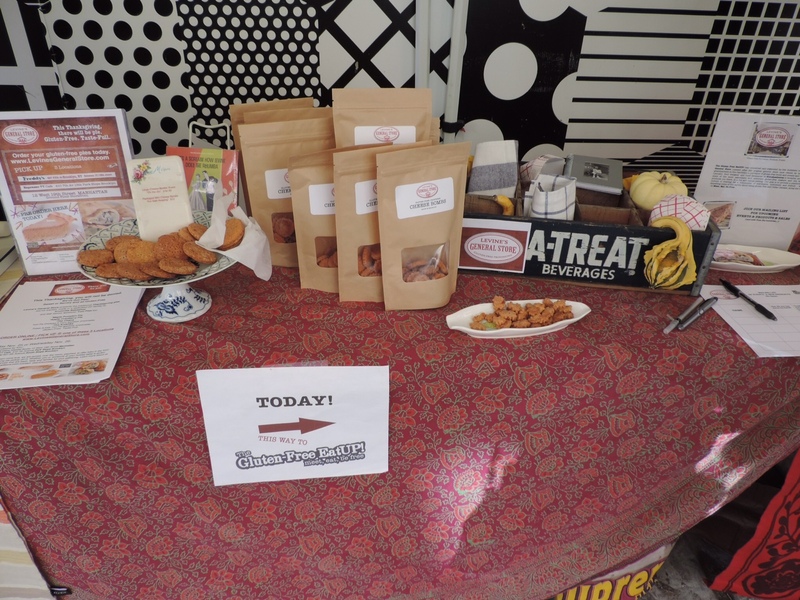 Revel in the culinary delights of vendors offering baked goods, hot savory comfort foods; sweet, salty, crunchy, (naughty), small batch treats, and healthy snacks. When you are gluten-free, sometimes it feels like you are on the outside. Not at the EatUP! In celebration of our First Anniversary, a GF EatUP! Fun Bag will be up for raffle. Prizes will feature graciously donated yummy treats from our event merchants, and from some of our favorite, far away, yet locally minded partners: Brŭlee Bakery – Pennsylvania based gluten-free artisan bakery, delicate cookies by the enchanting, Chef Lila (2010 James Beard Scholarship winner) and Kim and Jake’s Gluten-Free Bakery a husband and wife team establishment from Boulder, Colorado offering breads and buns! B63 Bus to the bar door! **Children under 21 must be accompanied by an adult, permitted in the backroom only. A Certain Pop Up Market is Turning One. Wow. What a year for Levine’s General and the The Gluten-Free EatUP! Thanks to all of you. 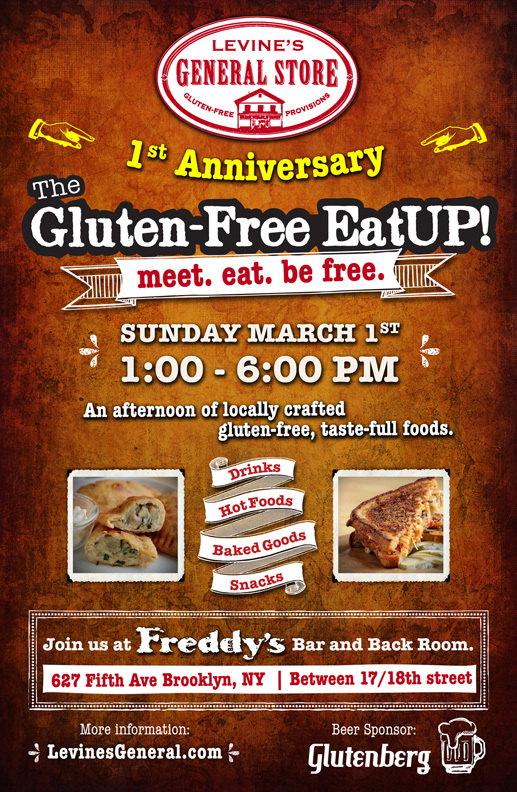 we will celebrate the 1st Anniversary of the Gluten-Free EatUP! Market. Original market vendors, and new makers. Have a safe, and delicious, gluten-free Thanksgiving. 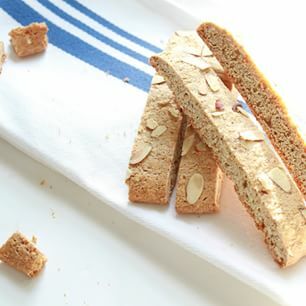 Stay tuned for more GF Holiday offerings and more Gluten-Free EatUP! Events. Looking to incorporate the Gluten-Free EatUP! into your next event? Be in touch. Highlights from our last market. Don’t suffer through another holiday watching all the others have the delicious fun. and savory appetizer Yum Pies too. The Gluten Free EatUP! 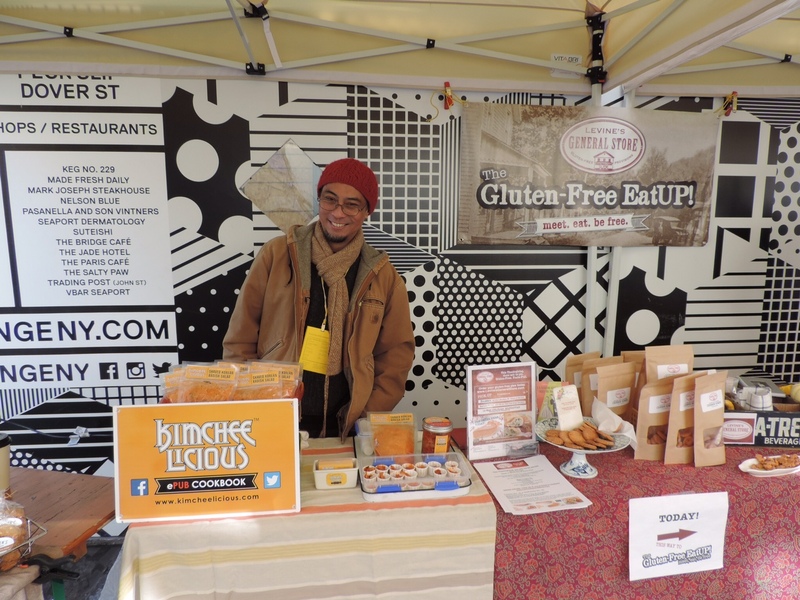 pop up market was co-founded by Levine’s General Store owner, Deb Goldstein and Kimcheelicious food designer Antonio Limuaco, as a response to Deb’s niece’s diagnosis of Celiac Disease, to broaden access to and help create an outlet for new gluten-free food makers to reach an eager gluten-free audience. The Gluten-Free EatUP! 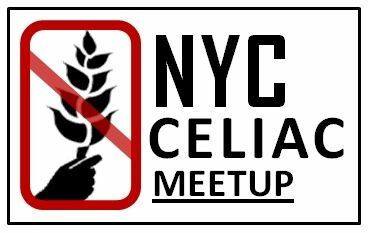 brings together some of the most passionate local gluten-free makers and the tastiest products in various locations in NYC and Brooklyn. Our goal is to provide a platform and culture of sharing for a community of merchants and customers and friends – to Meet. Eat. Be Free. Krumville Bake Shop founder Antonella Zangheri creates delicious focaccia, cookies, muffins and specialty cakes that celebrate her rich culinary Italian and Dutch upbringing — minus the gluten! Antonella grew up in Emilia Romagna, a region of Italy famous for its rich culinary heritage. In 2009, she was diagnosed with celiac disease and had to give up many of the foods she grew up eating. Disappointed with the gluten-free products available, she saw a need for more exciting options. 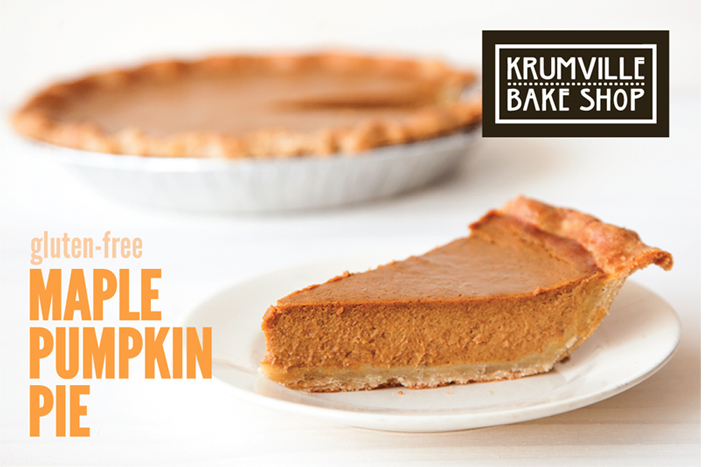 That’s when Krumville Bake Shop was born! OUT TO SEE at the South Street Seaport. A neighborhood festival celebrating local businesses and talents in art, music and crafts and food! Saturday and Sunday November 15 and 16. Levine's Gluten-Free EatUP! 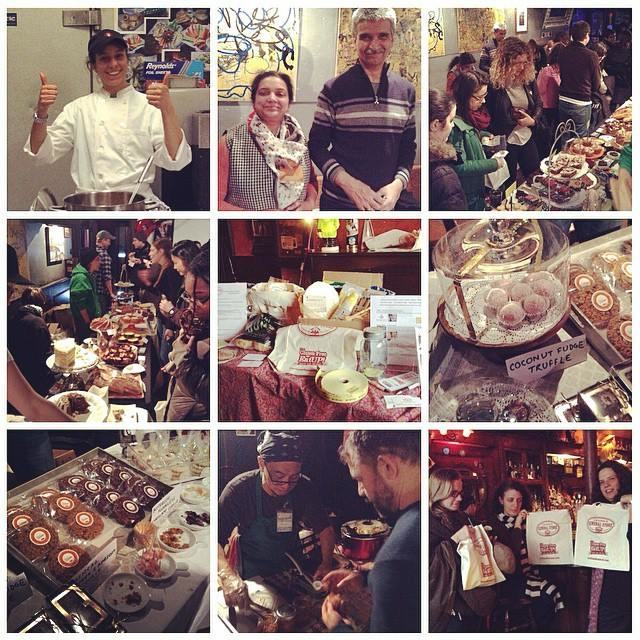 A pop-up market featuring locally crafted, gluten-free, taste-full delactables. The Gluten-Free EatUP! 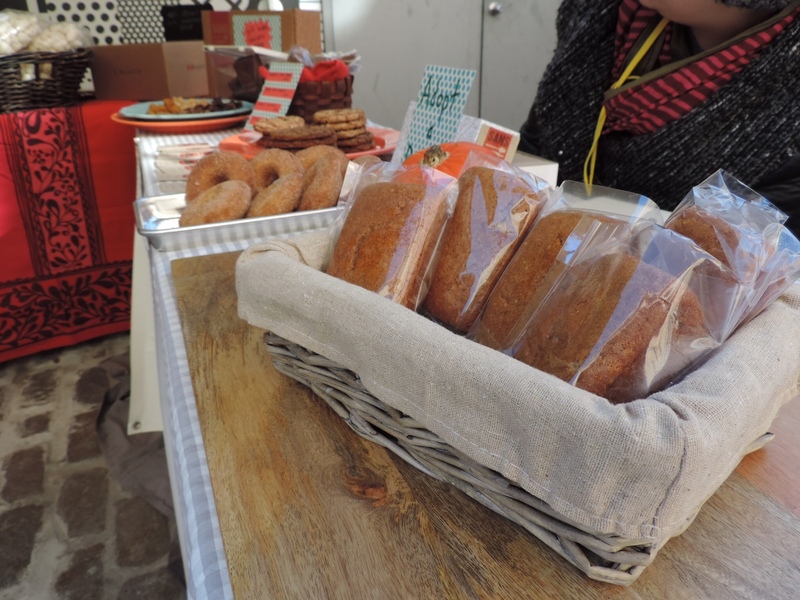 brings together some of the most innovative local gluten-free makers and the tastiest products. Our goal is to provide a platform and culture of sharing for a community of merchants and customers and friends - to Meet. Eat. Be Free. Popping up in various Brooklyn and NYC locations.